More than 50,000 soldiers died in the Battle of Gettysburg in 1863, the bloodiest battle ever fought on American soil. Today, the Gettysburg National Military Park is a National Park Service–run memorial to the lives lost during those three fateful days of the American Civil War. 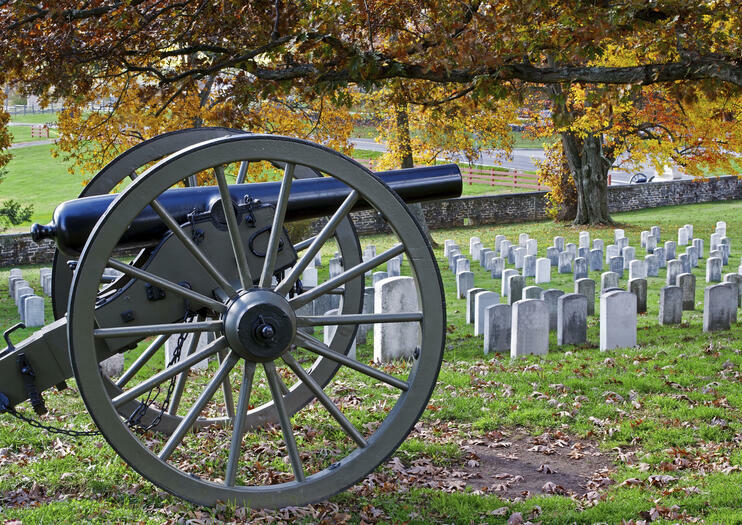 The Gettysburg battlefield draws Civil War buffs and those who come to pay their respects and learn about this landmark event in American history. Entry to the Gettysburg National Military Park and Visitor Center is free, but an admission fee allows access to a short film, Gettysburg Museum exhibits, and the Visitor Center’s Battle of Gettysburg Cyclorama, an immersive 360-degree oil painting. The park features more than 26 miles of paved roads connecting key Gettysburg battlefield sites. Take a self-drive battlefield tour using an audio guide or a self-guided map, or opt for a walking tour with a licensed battlefield guide. Bus tours are available from the visitor center, and Gettysburg day trip group tours from Washington DC are another option. Climbing on any monuments or cannons on the Gettysburg battlefield is prohibited. Be prepared for variable weather; summer heat and humidity can be intense and snow or ice may temporarily close some roads in winter. Ranger-led hikes, walking tours, and talks are available in the summer. Get info at the visitor center. Living history programs demonstrating Civil War tools and tactics take place on weekends from April to October. Beware of ticks when walking through tall grass and brush in Gettysburg National Military Park. Gettysburg National Military Park is located about 80 miles (135 km) north of Washington DC, near the town of Gettysburg, Penn. From DC, the best way to reach Gettysburg is by car or bus tour. It’s also possible to take a train to Harrisburg, Penn., before catching a bus to the town of Gettysburg, where public transit runs regularly between the town, the park, and other nearby Civil War sites such as the David Wills House, the Majestic Theater, and the Historic Gettysburg Train Station. While Gettysburg is open year-round, spring and fall are ideal times to visit due to mild weather. The National Military Park is open longest in spring, summer, and fall, and more activities take place as well. The park is open from 6 a.m. to 10 p.m. from April 1 to October 31 and has slightly shorter hours from November 1 to March 31. The Museum and Visitor Center are open daily. Every July 1–3, epic battle reenactments—with hundreds of participants dressed in period garb—recreate fateful battle days and hold lectures, kids’ activities, and educational workshops for visitors. Come fall, spooky after-hours Gettysburg ghost tours are held by candlelight. Highlights within Gettysburg National Military Park include the Soldiers' National Cemetery, Cemetery Ridge, and Seminary Ridge. Adjacent to the park is the Eisenhower National Historic Site, accessible by free shuttle from the Gettysburg Visitor Center. In the town of Gettysburg, you'll find the Shriver House Museum and the David Wills House, where President Abraham Lincoln finished writing the Gettysburg Address. Explore the sites around town on a segway tour or horseback tour. Zodra je enkele van de grootste iconen van Amerika hebt meegemaakt, kun je deze gedenkwaardige dagtocht naar Gettysburg nemen om ook enkele van de diepste historische wortels te verkennen. Geniet van het comfort van busvervoer per bus terwijl je je een weg baant door het landschap van Maryland en Pennsylvania. Zie Cemetery Ridge, waar Lincoln het adres van Gettysburg afleverde, en meer te weten kwam over het grootste gevecht ooit op Amerikaanse bodem gevochten tijdens een verhalende show en een gedetailleerd miniatuur militair diorama. Deze tour omvat ook een stop in het gerestaureerde huis van George Washington Shriver. Bezoek locaties uit de Slag bij Gettysburg tijdens een bustocht met een gids die je vertelt over de fasen van de driedaagse strijd, die een keerpunt was in de Amerikaanse Burgeroorlog. Je ziet Culp's Hill, McPherson Ridge, Devil's Den, Little Round Top en de locatie van de lading van Pickett. Als je een geschiedenis- of oorlogsfanaat bent, mis dan deze kans niet om meer te weten te komen over een scharnierpunt uit het verleden van de Verenigde Staten.